The U.S. Department of Transportation has released its first map of all the noise made by cars and airplanes across the United States. Though airports, ambulances, garbage pickup, and the neighbor's sweet new sound system can cost us our hearing (and sanity), most U.S. residents live in safe noise zones. But some people, mostly city-dwellers, may have cause for concern around their exposure to constant, too-loud sounds. 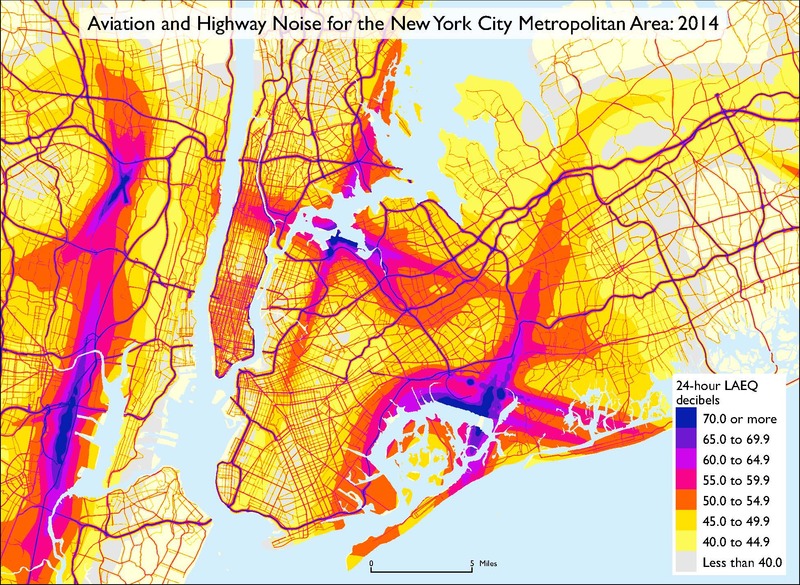 The National Transportation Noise Map shows that almost all U.S. residents—97 percent—hear background noise from highways and planes overhead at a safe 50 decibels, about equal to a humming refrigerator. A small fraction of citizens, though, hear noise equivalent to a garbage truck every day. Less than one-tenth of one percent of U.S. residents (approximately 223,000 people) hear 80 or more decibels on a regular basis. Sustained exposure to 85 or more decibels—heavy city traffic—can cause permanent hearing loss over time. In the New York metro area, pictured above, residents living near the region's airports or under flight paths are at greatest risk for unhealthy noise exposure. The U.S. 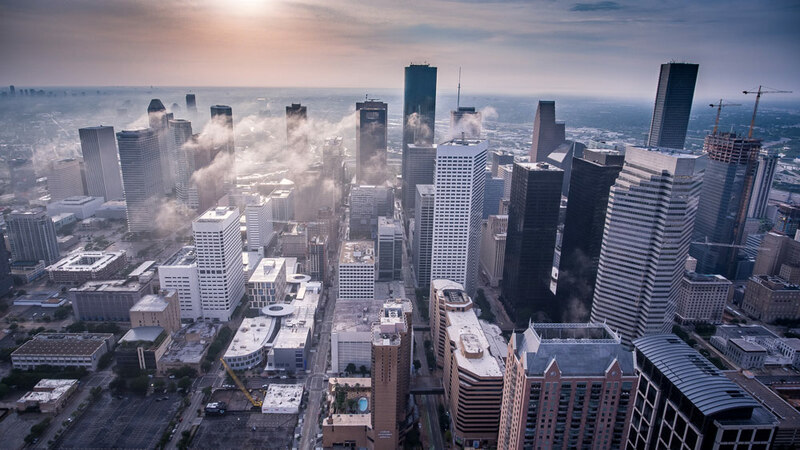 DOT's Bureau of Transportation Statistics (BTS) compiled and analyzed data for the Noise Map, which is meant to help agencies track transit-related noise at the state and local levels. Officials can use the information to implement policies that reduce transit noise. The layers, which now include data up to 2014, will be updated annually and may eventually include noise data from rail and ships. The Noise Map is part of the U.S. DOT's National Transportation Atlas Database (NTAD), a collection of publicly-available infrastructure data. You can do a lot in fifteen minutes: cook some surf-and-turf, blast through paperwork, star in a mediocre crime drama, or travel 40 miles between major East Coast cities. Well, not yet. Given the excruciatingly slow pace of infrastructure modernization in the U.S., there will be a wait on that last one, probably for decades. Yet, the U.S. is taking small steps towards twenty-first century transportation. Last week, the U.S. Transportation Department granted $27.8 million in Federal Railroad Administration funds to the Maryland Department of Transportation and the Maryland Economic Development Corporation to conduct feasibility studies for a maglev train line that will run between DC and Baltimore. https://www.flickr.com/photos/geoffwhalan/16578045553/in/photolist-6ZNtXq-bkjuSb-byeyp6-qdzcUH-u8F6rc-9DN21-byeq9i-bkjwuj-7sUSTT-4TEqye-qZoBxP-78WXSR-7ya8wK-rfWPnB-7sYQD7-7sYQLS-ziKfWR-6pTxyU-4SpKK-21THR5-4jpRM-Ab3VT-aans1n-aansdz As the above video illustrates, Maglev trains move very, very fast, reaching speeds up to 375 miles per hour. If built, the DC-Baltimore maglev train would be a 40 mile demonstration project to determine how to best bring maglev trains to the United States. Overall, the track will cost an estimated $10 billion to build. Japanese transportation companies and the Japanese government are keen on spreading their products and expertise to the United States, a potentially lucrative market. This spring, Governor Larry Hogan and Maryland Transportation Secretary Pete K. Rahn rode on the Yamanashi Maglev Test Track. 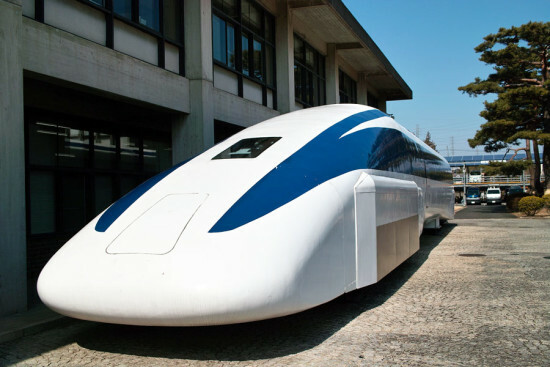 The Japanese government has committed $5 billion to the project, and the train operator, the Central Japan Railway Company, will not levy licensing fees for the technology. Stateside, The Northeast Maglev, a private investment group, will also contribute to the project. For those who can't delay gratification, ferroequinologists the world over love to share their love for ultrafast trains. As of October 27th, the Bronx River Greenway is one mile closer to completion. The United States Department of Transportation awarded a $10 million TIGER grant to the city to build three bridges and a three-quarter mile path connecting the South Bronx's Concrete Plant Park with nearby Starlight Park. 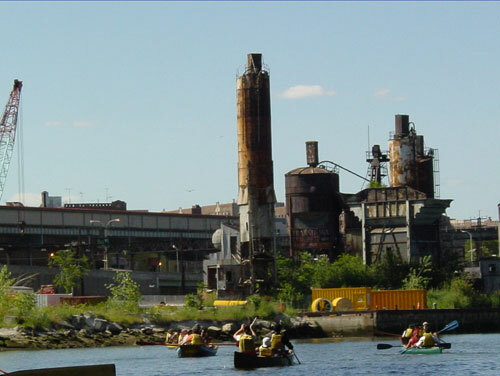 Though modest in scale, the grant adds momentum to the decades-long movement to green one of the most industrial areas in the borough. Two of the bridges will be built over the Bronx River—one near Westchester Avenues and the other adjacent to 172nd Street. The third bridge will be laid over Amtrak rail lines at East 172nd Street. 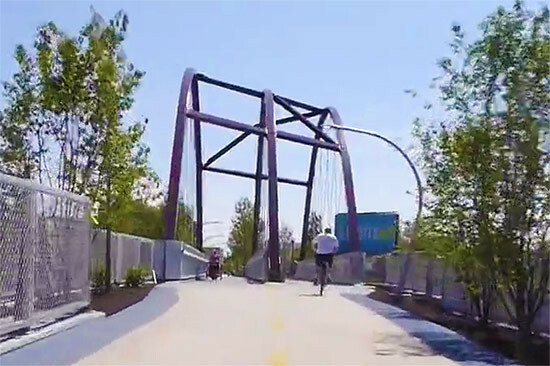 When this critical link is complete, cyclists and pedestrians will be able to enjoy 1.8 miles of trails along the river, from East 177th Street to Bruckner Boulevard. Currently, recreation-seeking Bronxites who wish to travel between the two parks face a daunting and dangerous trek across a Sheridan Expressway access ramp. The New York State Department of Transportation committed funds to the project in 2008, but the DOT had to negotiate usage rights with Amtrak. The Acela runs adjacent to the Bronx River, in between the two parks. In total, the project is estimated to cost between $29 and $32 million. Federal, state, and local governments, as well as nonprofits, have pledged $12 million towards the project, in addition to the TIGER grant. Still, there is $7 to $10 million dollar funding gap for the project. Construction will begin June 2016 and be complete by 2020.